They Do Not Obey? We Do Not Obey. I went to the courthouse this morning to witness the hearings to determine if the Budget Adjustment Bill rammed through by the Current Occupant of the Governor's seat in Wisconsin had legal standing. Because of the administrations unprecedented end-around process there is some question about if the law is indeed "in effect." The Current Occupant is proceeding as though it were, and if the court rules otherwise, the state will - foolishly - spend millions to undo all the hastily implemented changes. Not that the Current Occupant cares. So the courtroom was filled, and the overflow room (the place to be) was full, so a second overflow room was opened up. While fabulous, it made for boring photos. My layman's take on the morning hearings was that the administration wanted this law in effect and did not much care how it happened. That a judge issued a stay on the law, and ruled that the Secretary of State could not proceed with publishing the law mattered not one whit. This administration does not care about legal niceties or even complying with the law. There are one, or perhaps two, more half-days of hearings before a decision is reached. 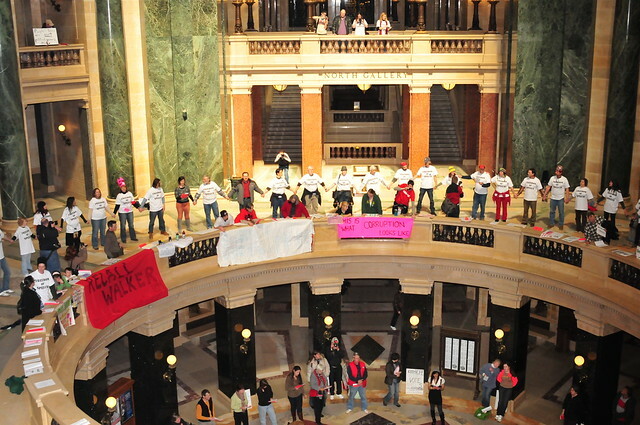 In the meantime, ongoing events in the Capitol are worth noting. The administration created a new "administrative code", a rule, that created a limited free-speech zone in the Capitol. Apparently they believe that an administrative code trumps the First Amendment. On Sunday a family was ticketed $202.50 for disobeying the code and having a hand-held paper sign 15 vertical feet from where it was permitted. People responded yesterday and showed up in limited numbers with signs, and few people were ticketed (I heard just over a dozen, but that is just anecdotal). Today there were more. There are more photos from today, and many from past weeks in a SLIDE SHOW. The most recent photos are first. 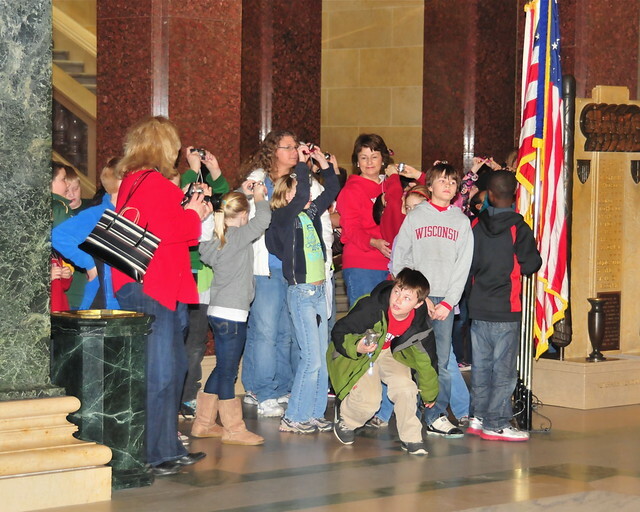 One of the things that was important to me today was the several school groups that came through the Capitol on tours. What a civics lesson! Of course they were going to want to know why there were all those people, from college to retired, in the Capitol, holding signs, singing and chanting, and SMILING. Truly a teachable moment. 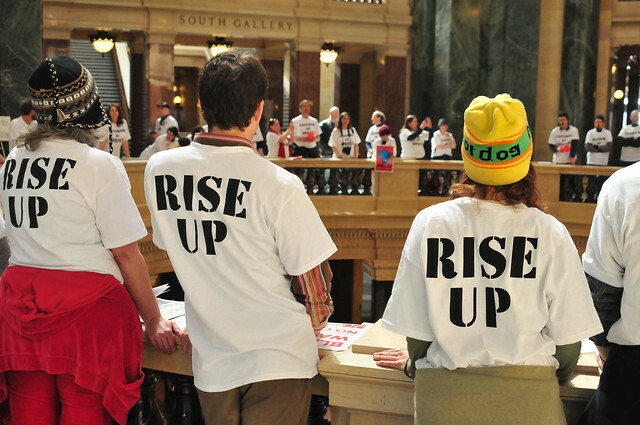 The Current Occupant is unlikely to stop his civics lessons to Wisconsinites anytime soon. His disregard for procedure will cost the State millions in legal fees, and has already cost over $3 million in police overtime. We are a hearty bunch, we Badgers, and the recall effort for eight eligible Republican senators is going well. If only half are recalled and replaced, the aggressive agenda of the administration will be slowed and blunted. If all are successful, we have genuine clout. There is an election on April 5th that includes a race for Supreme Court Justice. The incumbent is in complete agreement with the Current Occupant, while his opponent JoAnn Kloppenburg is more sympathetic to the Liberal/Progressive constituency. In theory an impartial body, when a political party wants to defang labor unions, de-fund health care, slash school budgets, privatize schools, and restrict women's personal choices about contraception and pregnancy, then a force must resist that.